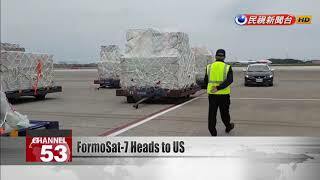 The FormoSat-7 satellite group was shipped out to the U.S. today. This group of satellites was jointly developed by the U.S. and Taiwan. It's set to launch as early as June 22. Officials say that every precaution is being taken to ensure that the FormoSat-7 arrives safety. It will take over the FormoSat-3. It will collect weather data using state-of-the-art instruments to enhance weather forecast accuracy by at least 10%.